Shares of Finnish phone maker Nokia dropped 14 percent yesterday after the firm announced they expected to publish losses for the first six months of this year, due to strong sales of competing smartphone handsets, and dwindling Symbian-based handset sales. Nokia estimates their mobile revenues will be around €4.2 billion ($5.5bn), a 40 percent drop on the previous year on year revenue generated in 2011, which all told adds up a €126 million ($166m) loss according to the Guardian. Once the figures are made publicly available it will mark the sixth consecutive quarter in a row in which Nokia's mobile operating unit has published declining revenues. "During the first quarter [of] 2012, multiple factors negatively affected Nokia's Devices & Services business to a greater extent than previously expected," Nokia said in a statement yesterday. As a result, operating margins in the second quarter will be "similar to or below the first-quarter 2012 level." The announcement around midday sent shares in the company tumbling to their lowest since the late 1990's. "Nokia's challenges have been exacerbated by rampant competition - notably from Apple and Samsung who are extracting a disproportionate amount of margin from the industry at present," Ben Wood from CCS Insight said, noting that the first half of this year was always going to be a challenge for Nokia. There is no doubt that the popularity of Nokia's Lumia range of Windows-based smartphones has helped buoy the phone maker's revenues, but increasingly slower Symbian phone sales in the Eastern markets, most notably China, India, the Middle East and Africa due to increased competition is affecting the firm's profits. If Nokia is to rekindle the success and dominance they held back in the 1990's, it's crucial that new devices such as the Lumia 900 sell in large numbers in the US market. Despite offering a fresh platform and beautiful unibody designs they face strong competition from Apple's iPhone and the army of Google Android-based smartphones. With competitive pricing and ever-increasing numbers of app's being announced for the Windows Phone7 OS, it's quite possible the company could return to their former glory. 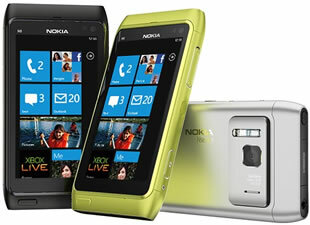 Nokia launched their Lumia 900 smartphone to the US market on Easter Sunday. Almost immediately complaints surfaced regarding connectivity issues, with the Finnish firm promising a software fix for April 16. For a limited time, Nokia is offering all AT&T customers purchasing a new Lumia 900 before April 21 a $100 credit to their bill, effectively making the device available free on contract with AT&T.